I know spring officially started last week, but it’s still a bit chilly where I live so for me, it’s still warm and cozy soup season. 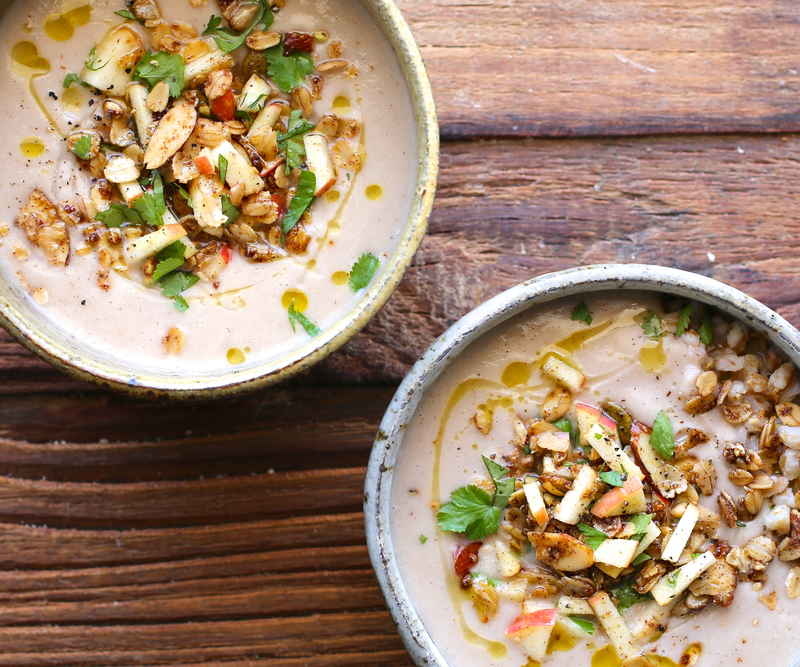 Fortunately this creamy cauliflower soup can be eaten during the fall, winter or spring. It’s very tasty and super easy to make. And, as I mentioned in my last post, Cauliflower Steaks and Herb Salsa Verde, cauliflower is a cruciferous vegetable and it behooves us to include several servings of cruciferous vegetables in our diet each week. Here’s another option to try! For this soup I pulled out My Masala Dabba and seasoned this soup with garam masala, the aromatic blend of spices often used in Indian cuisine. The word garam refers to “heat,” as in “to heat the body” in the Ayurvedic sense of the word, and masala is a mixture of spices. 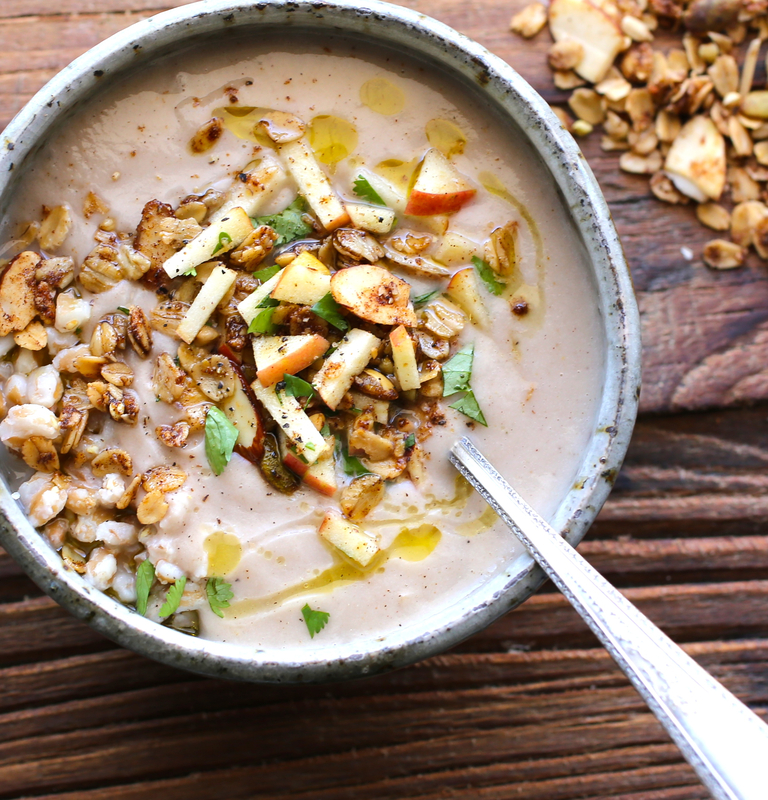 I decided to top the soup with apples and a savory spiced granola. I had been working on a recipe for a savory granola, but couldn’t quite get the seasoning as I wanted until I decided to pair it with this soup. Then it all came together beautifully, adding a depth of flavor and texture that I really liked. I hope you like it too. I served mine with farro or brown rice. In a large soup pot, heat olive oil. Add garam masala and stir. Add leeks and sauté until softened, 3-5 minutes. Add cauliflower and salt and stir to coat with spices, 2 minutes. Add 5 cups broth and bring to a boil. Reduce heat and simmer until cauliflower florets have softened, 30-40 minutes. Ladle soup into a high speed blender and blend until smooth. Return soup to the pot under low heat. Add more broth if necessary. Taste and adjust salt. 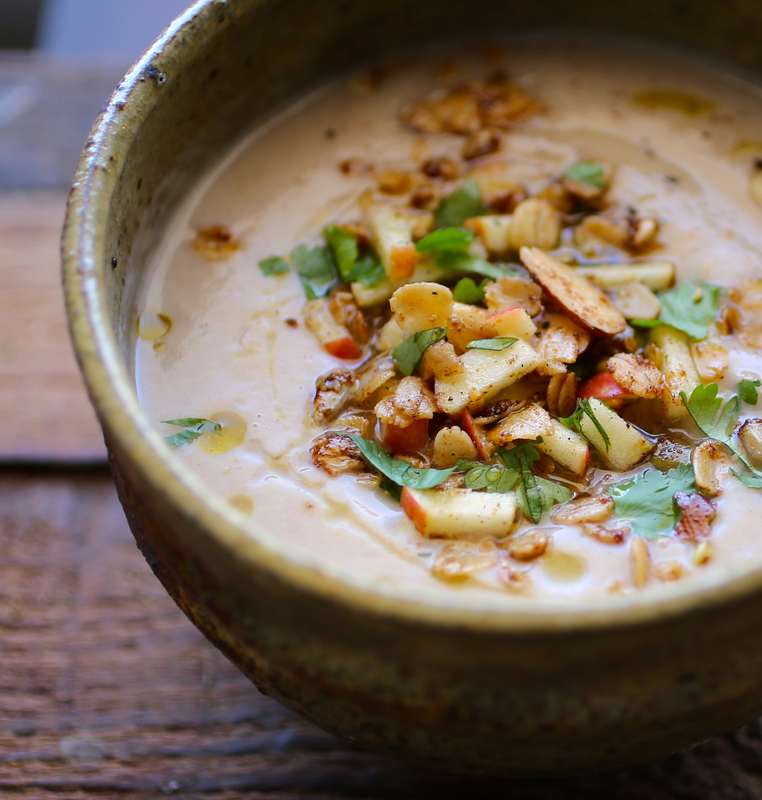 Ladle soup into bowls and garnish with spiced granola, apples and cilantro. Drizzle with olive oil and sprinkle with black pepper (optional). Serve with farro, brown rice, or bread. Preheat oven to 250F. Combine all the dry ingredients then add coconut oil and honey. Bake for 45 minutes to one hour, turning frequently for even baking. Cool to room temperature. Use as you like. Store the rest in an airtight container. Another fabulous cauliflower recipe! As I type this see your related Rustic Parsnip Soup, I’m headed to that page as well. I have parsnips in the fridge right now. I really love how your garnish your soups. It’s the way we enjoy our soups too. Your savory granola is brilliant. Thank you! I think soups are one of the hardest things to photograph! I love adding interesting garnishes as they not only add flavor, but also interesting texture and depth for photographs. Wow this looks amazing! I can’t wait to try it! I love the savory granola idea. Thank you!! Please let me know what you think when yo try it! 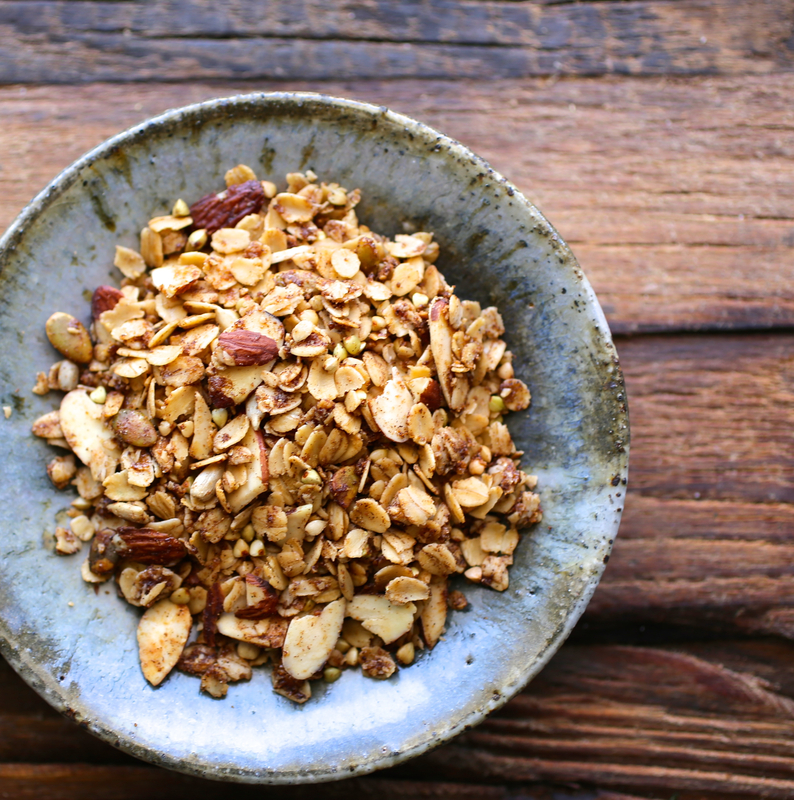 Love that spicy granola, such a creative recipe! This looks gorgeous and I love the idea of a spiced cauliflower soup! Yum! Thank you Aubrie! So glad you like it! Thank you Fae! Glad you like the soup! Congratulations on the migration! I’d like to do that eventually…. For now it’s just a new theme for me…. Glad you like it. It still needs tweaking. 🙂 Been quite busy here too! I was at your site earlier today but I received a message that it would be temporarily down. I just went again, but I don’t see your posts, just links to other magazines. Beautiful. I really like the way you eat. Your photographs are just lovely! So glad you like this too! I love mixing interesting/exotic flavors into the ordinary while still making it healthy and delicious! So happy you like the photograph, I’m still learning with every post! 🙂 Thank you once again! Gorgeous! AND Granola?! Sounds and looks amazing.